Carved and painted in 2010. 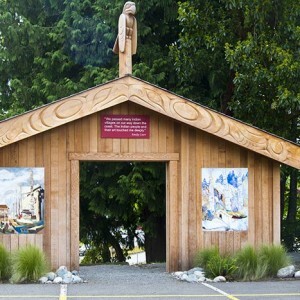 This freestanding structure, designed by Carey Newman, features the front of a traditional longhouse. It is complete with an open doorway as the door is always open to the Big House. Newman carved intricate Salish designs on the fascia boards. A brooding eagle sits atop the peak of the roofline. This eagle, which crested a memorial pole that was raised in 1882 in Skidegate, has long since fallen. Its memory has been preserved in a 1929 watercolour painted by Emily Carr and titled The Great Eagle Skidegate BC, 1929. Newman has carved an eagle, inspired by the painting, and in his words, “tying together the new and old and continuing an artistic cycle that began when the subject of that Emily Carr painting was first carved in Skidegate”. 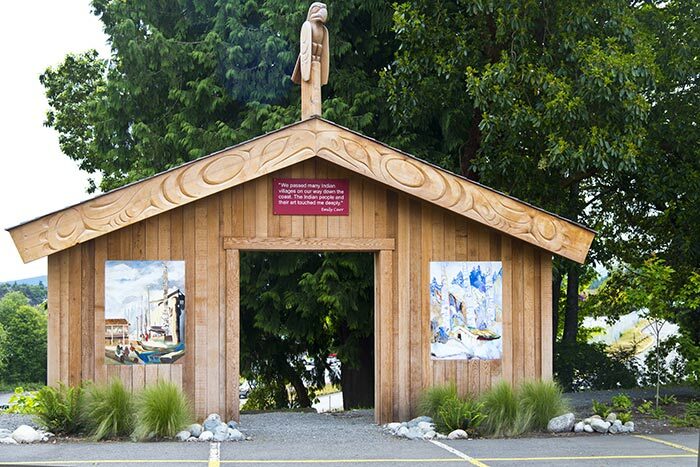 The paintings on either side of the doorway are some of the finest depictions of First Nations villages painted by Emily Carr. Canoes and Totems (Alert Bay) 1908 and Haida Totems, Cha-atl, 1912 were reproduced by Cim MacDonald.